Nicaragua, or Volcanes y Viento!! We didn’t plan to stop in Nicaragua as we made our way down the coast, but weather and circumstances changed our plans. After leaving El Tigre, Honduras on the outgoing tide at o’dark-thirty we motor-sailed through the maze of pangas and nets around the point and into a decreasing wind, passing Puerto Corinto around 3:00pm. We’d gone about three miles past the channel entrance when we ran into a line of squalls and a 25-knot “noserly” (aka wind directly on the nose). With 150 miles yet to go we decided to make a quick u-turn and anchor in Corinto for the night rather than bash into what was quickly becoming an ugly ride. Our friends on m/v Wildest Dreams and s/v Shantey were already in Corinto, so we were happy to have buddies nearby. While on passage that day we’d also discovered a problem with charging the batteries, so working on the issues in a calm anchorage was a much better choice than worrying about it while trekking through a blow. First things first, it was time to check in with the Port Captain, so the next morning we hitched a ride in Wildest Dreams’ dinghy and tried to find a place to tie up. The choices were a nasty mud beach at low tide with hidden pipes sticking up waiting to impale the dinghy, or a slippery rock wall, or some rusting shrimpers rafted together at the dock…okay, rock wall it is. Thankfully a friendly gentleman pointed us into a corner that looked like it might work, so we crawled up the rocks, tied the dinghy to a shrimper and threw out a stern anchor to keep the dinghy from grinding against the huge barnacles on the hull of the shrimper. Our next step was to find the Port Captain’s office. We asked one of the guards at the gate to the power plant where the office was, and he gave us very specific, and very involved directions in Spanish. We did pretty well at first to understand all the rights and lefts, and two more blocks, and one more street…, but after a while we must have looked a bit confused. He laughed and called over a young man who then proceeded to lead us on his bicycle. It was a long walk with plenty of twists and turns, so it was nice to have a tour leader! We finally arrived at the Port Captain’s office looking a bit worse for wear and sweating like gringos, but we received a friendly welcome, and the naval cadets quickly brought out chairs for us to sit in while we waited for the Captain. Eventually all the people were in place; the Customs official, Immigration official, and the Port Captain and his assistants. Marty and I were led into the Port Captain’s air-conditioned office where six people were all working on getting us checked in. It took about half an hour, lots of dollars, and a bit of explaining as to who we were, where we were from, where we were going, and what a “Happy Dance” is! After we were “finito” it was Wildest Dreams turn, then we were finally set free to roam around town. Town square with Christmas tree! Nicaragua has been getting some bad press lately due to violence in the cities stemming from a bad political situation. Thankfully in Corinto we didn’t see any of that, and we were actually told by a local (Florida Bert, our tricycle driver) that Corinto was one of the safest places in Nica because the President owns the port, and it’s the biggest commercial port in the country with plenty of extra security. We did feel uncomfortable when groups of well lubricated tough guys were yelling at us and making weird comments, but that wasn’t too often and all the other people we met were very friendly and helpful. The town of Corinto is bigger than we’d imagined, and also much poorer. There are very few cars on the roads, only bicycles, motorbikes and a few taxis. The main form of transportation is via tricycles with seats for four in front that the driver has to pedal. There are a few shops and restaurants, but most were empty or closed and the locals didn’t appear to be spending much. There’s a town square with a church and public market, a few stalls selling wares, and lots of people looking as though they were surprised to see Americans! We found a good spot for lunch, with delicious food and gringo prices. One day a cruise ship came in, which surprised us, but it didn’t seem as though too many people left the ship; and in talking with a restaurant owner, he felt the bad press and the bad president is directly affecting the locals’ business. He also seemed to think that the “dictator president and his wife” would be gone soon and the country would start turning around. When we found what we hoped was a good weather window we went back to the Port Captain to do all the paperwork again and prepared to leave Corinto at daylight the next day. The Navy drove by and took photos of the boats and made sure that we left when we said we were going to. We headed out of the channel on the outgoing tide and pointed the bow south for a planned overnight run to San Juan del Sur, about 200 miles away. This section of Nicaraguan coastline from Corinto down to the northern edge of Costa Rica is notorious for nasty winds called Papagayos. These are gap winds build in the Caribbean and funnel across the low-lying narrow land mass out into the Pacific. In a word, it’s rough, and the farther off shore you travel the rougher it gets as the increased fetch creates even bigger waves. We had chosen to leave under a forecast of 15-20 knots, hoping for a close reach with enough wind to sail but not over stress the crew…yeah, that was a dream. We’d heard other cruisers say that when planning to travel this coast that you need to double the forecasted wind speeds. We’re now believers in the double down method. Our day started out well, motor sailing in light winds off the forward quarter. It wasn’t long before the wind moved in front of us, so that to maintain a course near shore we wouldn’t be able to sail, as we would have had to angle away from shore which we really didn’t want to do. The wind was now well into the 30’s so we reefed the main, battened down the hatches and got mentally prepared for a long crappy ride. We were also starting to feel the effects of having been lulled into thinking we could believe the forecast, because we’d followed our rhumb line and we were now too far from shore where the waves were getting steep and very close together, in other words, not comfy at all. Green water was coming over the bow and spraying into the cockpit, the waves were slowing us down, and the wind gusts were providing a wild chilly ride. Welcome to the tropics! After a few hours of this we decided to cut the trip into two segments and headed for the next good anchorage. We pointed toward Masachapa, set the hook, blew the conch for sunset and relaxed…to get ready for another day of fun!?! Day two was much like day one…having to motor sail about 35 degrees off the wind, fighting the gusts and wind waves. We’d started out with a reefed main and kept it that way all day. Even though we had to constantly adjust the sail as the wind shifted forward and aft, it was giving us quite a lift and we were happy to make the best time possible. Our speed over ground varied from 4 to 7.5 knots depending on the current wind and waves. When the waves slowed us down to 4 knots we started thinking about finding another hidey hole. The next anchorage was Astilleros, a protected anchorage out of the wind and swell, but getting there would mean driving directly into the steep swell. With a report from one of our Bahia buddies up ahead that the conditions smoothed out after rounding the point, we decided to carry on the three or four hours into Pie del Gigante and hope for the best. Luck was with us and even though the winds were steady in the low thirties with higher gusts, the sea state did settle down a bit as we rounded the point and came closer into shore. We were happy to see the sheltered anchorage of Pie del Gigante ahead and we were soon anchored and enjoying an afternoon swim. After a peaceful night at anchor it was up at first light for the final push into San Juan del Sur, our final destination in Nicaragua. The winds were already building so we were glad we’d chosen to start at dawn. San Juan del Sur is what I would call a “gringo-ized” town, though not the Cabo or Cancun type of gringo-ized..with big box stores and heavy on the retail hell where you’d never know you’re in a foreign country; this is a friendly kind of gringo-ism, with plenty of young surfer dudes and dude-ettes, diverse nationalities, and a great mix of eclectic foodie cafes and restaurants. It’s a fun spot, but man does it blow (not the town – the wind!). We had a couple of calm days when we first arrived so that we were able to explore the town a bit and take in some of the sights. 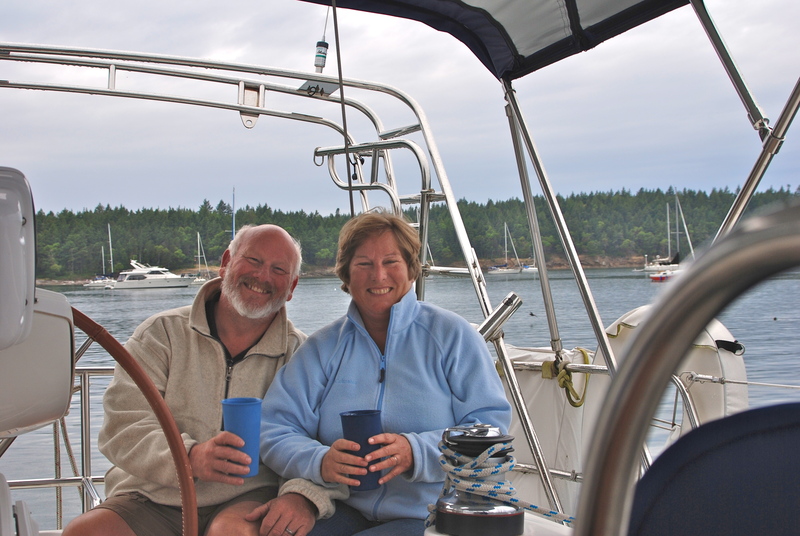 It’s a beautiful spot with lots of friendly people and we wished for a calmer anchorage so that we could explore more. So now we have a weather window for a couple of days before another bigger blow. We’ve been told by a local that these aren’t even the infamous Papagayos yet; “this is just wind”. Well, Papagayo or not, it blows!! Today is check out of the country day, followed by some provisioning for Christmas dinner, then off we go in the morning to Bahia Santa Elena in Costa Rica. Nicaragua is a beautiful country, with friendly people who are struggling against a tough political situation. The two towns we’ve visited, Corinto and San Juan del Sur are at opposite ends of the spectrum in pretty much every way. We’re glad to have visited and to have experienced yet another side of Central America. It’s all these little vignettes and memories that we take with us that make the cruising life such a joy.